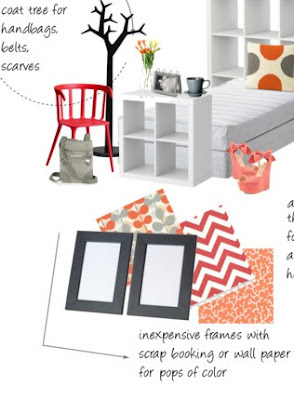 A reader recently asked me for advice on organizing/re-decorating her teen bedroom. Mary writes, "I was browsing Pinterest and somehow ended up on your site! I wanted to redecorate my room in coral and gray. I have a smaller room and I am a teenager so it's usually a tad bit messy. I was wondering if you could lend me some decorating tips to have an organized yet roomy appearance. Your newest fan, Mary"
I choose the large items from Ikea because it's a store that's all about storage for small spaces and it's affordable. The Expedit series is very versatile. You can add doors, drawers, baskets or bins to fill the cubbies. Or just leave them as is. Using them as I've shown above will give plenty of extra storage to organize odds and ends. You can even use them for clothing by adding doors or drawers as I've done in our closet (see Master Closet Makeover). 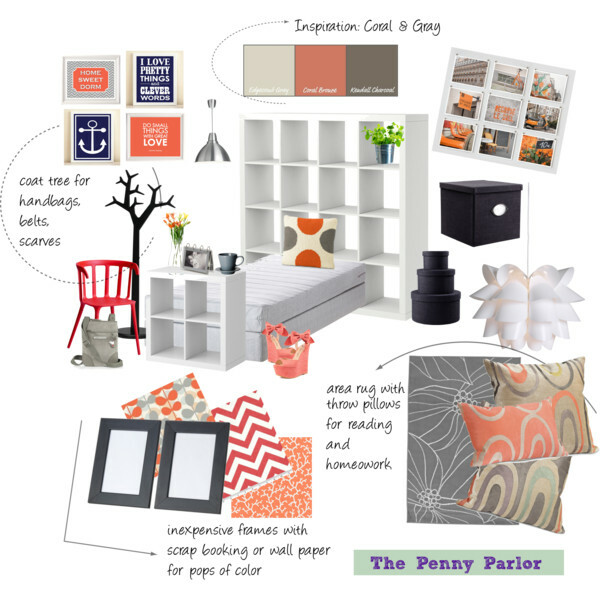 For pops of color try framing scrap booking paper or wall paper. I chose Ikea frames above. Re-purpose old decor. Spray paint them in your new color scheme. Add a coat tree to hang handbags, scarves, belts or your everyday fall jackets. Wal-Mart and Target sell them as cheap as $30. 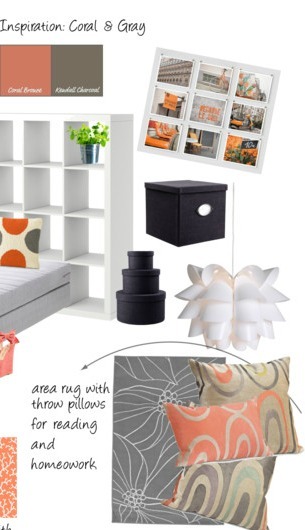 For a reading/homework nook, grab an area rug and some throw pillows for the floor. 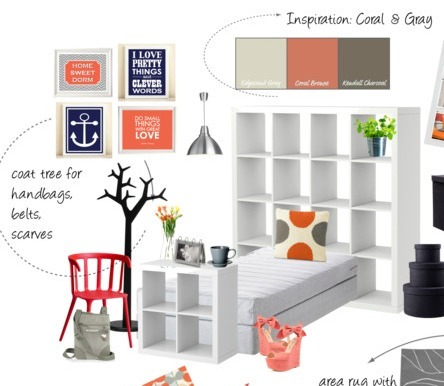 Add a few shelves on the wall from Ikea Lack series to store school work and books. Visit Etsy.com for unique, colorful wall art. Wrap books in colorful paper to sit on your shelves or line the backs of your Expedit shelves with paper. Get your closet in order. Go though clothes and get rid of things you don't wear. Paint will instantly transform a room. Do an accent wall. Or paint a large canvas or three to hang across the wall. Even if you're not an artist, you can do an abstract piece with stripes of color or use painter's tape to do a design. Display your jewelry as art. There are lots of inspirational ideas for this on Pinterest. It will also keep it organized. Look for window treatments to brighten up the space. Always hang them wider and taller than your window to make the window appear larger.